We are inspired to make the costumer experience at bars closer to a thing of the future. Today, we expend a dramatic amount of human labor to tend bar and complete rudimentary tasks that could be automated by the newest wave of intelligent robotics. We have a drive to revolutionize the way bars are run and therefore increasing the demand for alcohol products at select bars (serving ABInBev beverages). The increase in sales will benefit farmers nationwide. Additionally, we used Baxter to directly assist the farmers in sorting grains and identifying foreign particulates. We wanted to help the farmers directly and show the capabilities of intelligent robotics in the agricultural setting. We're passionate about helping agricultural development on both the consumer and producer standpoints. We use a Baxter Research Robot to tend bar at the hottest bar around. Baxter sports a tasteful bow tie and is more than willing to offer you a cold beer after pouring. Baxter is able to pour shot or hard alcohol from any 750 ml bottle with standard bar equipment, not specific equipment required, which is important for mass implementation of bartending robots. Baxter will also pour you a beer into a proper glass (tilting, of course). Afterwards, he'll hand it to you for your enjoyment! 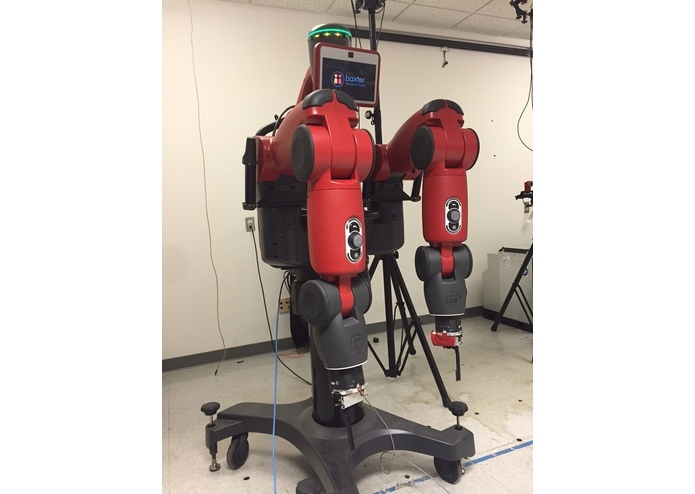 We developed on the Baxter robot platform in the Robotic Operating System (ROS). ROS enabled us to communicate with the low level hardware and control the actuation of the joints and receive the information from the sensors in our custom sensor messages. Using ROS and our motion planning experience, we use the sensors on-board Baxter to sense objects and manipulate the arm around the objects to pick them up and pour in the correct glasses. Baxter, though a research platform, has a number of downsides. Its networking capabilities are required, but very poorly implemented. After spending 4 hours trying to connect to it over the ROS environment, we eventually got our way in and were able to communicate with Bax. Also Baxter requires unique data types to communicate with the hardware, developing these data types were tricky and required a great deal of trial and error. We learned about motion planning of biarmed manipulators with collision detection and grappling. Also, we learned how to use camera feeds from Bax to complete computer vision tasks like identifying grain and identifying mixes of grain with foreign particulates. We're going to make Bax dramatically more robust, using state of the art robotic architectures to manipulate Baxter in more complex environments (like bars) and interact with people more heavily. The ultimate goal is to develop software and firmware capable of creating a functional autonomous robotic bar tender then create our own robotic arm at a fraction of the price with only the hardware needs the bartending problem presents.